Using the design criteria established during the workshop, the study designed and developed a physical therapy device using eTextile techniques and wearable technologies. The roles that social acceptability, wearability, and fashion play are central factors to product adoption of wearable products. 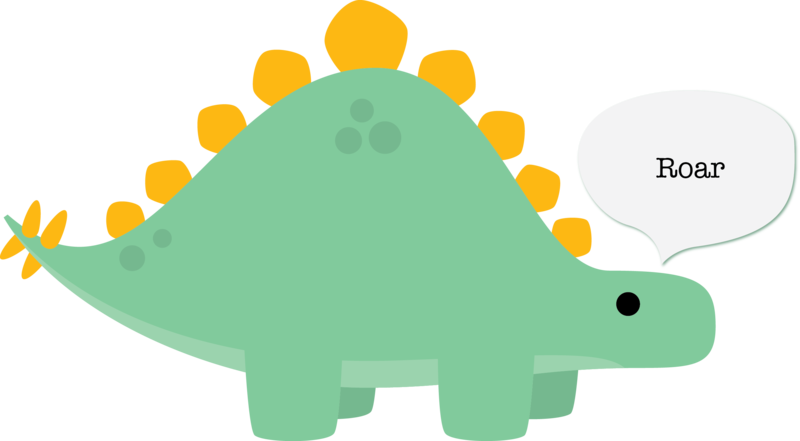 The objective was to develop a platform for which others can develop their own system. 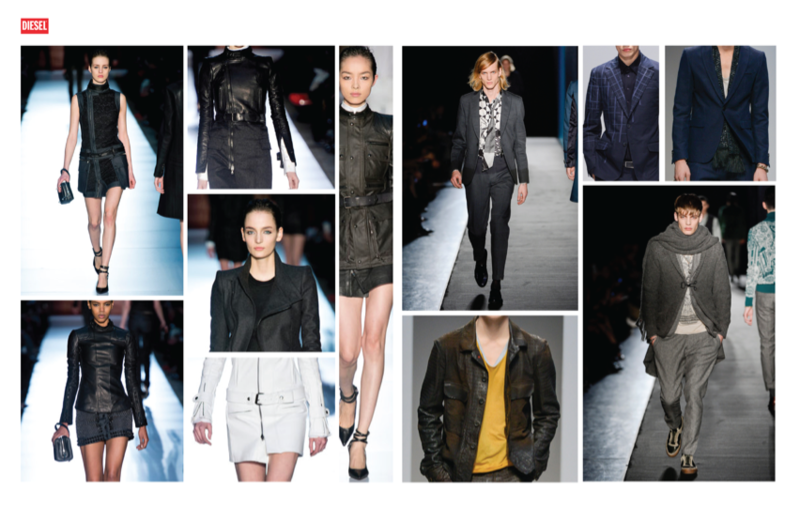 Lastly, this study evaluated the wearability and social acceptability of the final product. The goal of this phase was to assess the design criteria developed throughout the study and establish the validity of the design platform. Knitted stretch sensors are not a new field, but instead of using conductive yarns, this method knitted conductive threads in with the wool yarn. 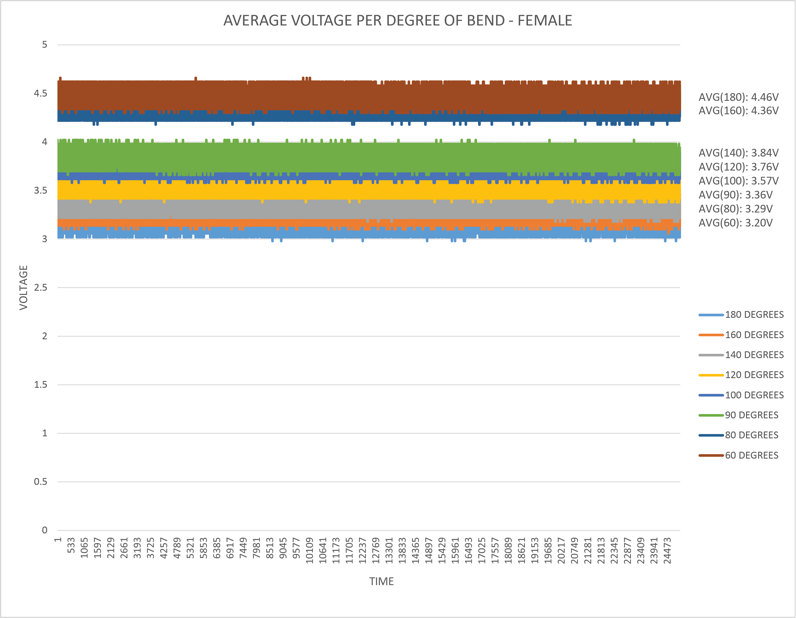 This research was conducted during Wearable Product Design course project taught by Professor Clint Zeagler in the fall of 2012. 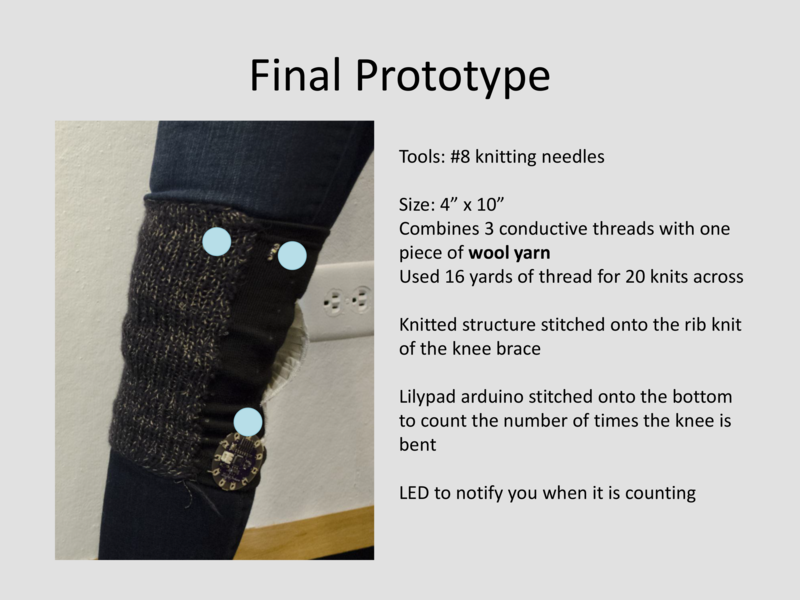 The brace consisted of the knitted stretch sensor, the Lilypad Arduino, and the LED as a feedback mechanism for reaching a specific degree of bend. 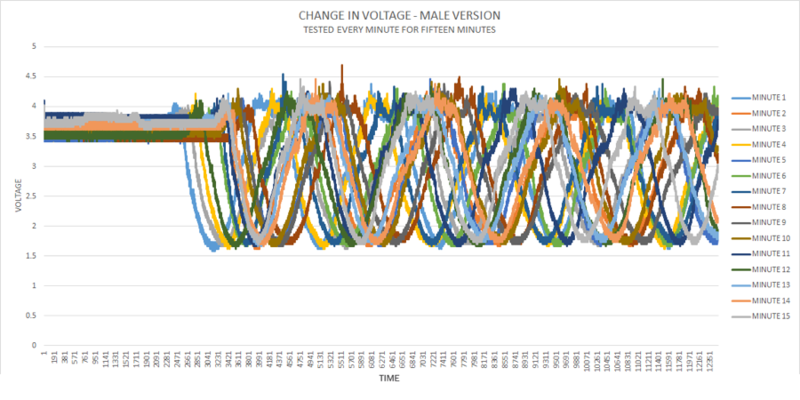 The graph shows that as the knit stretches over the knee, the voltage decreases, allowing for detection of extension and flexion. 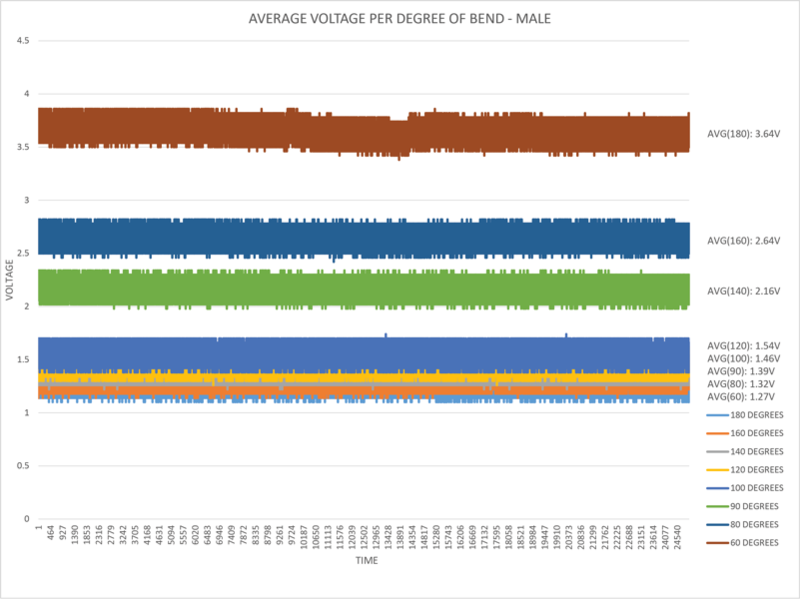 Kirchhoff’s Law (voltage = current * resistance) dictates that voltage and resistance are proportional, therefore as the resistance in the stretch sensor increases, so will the voltage. 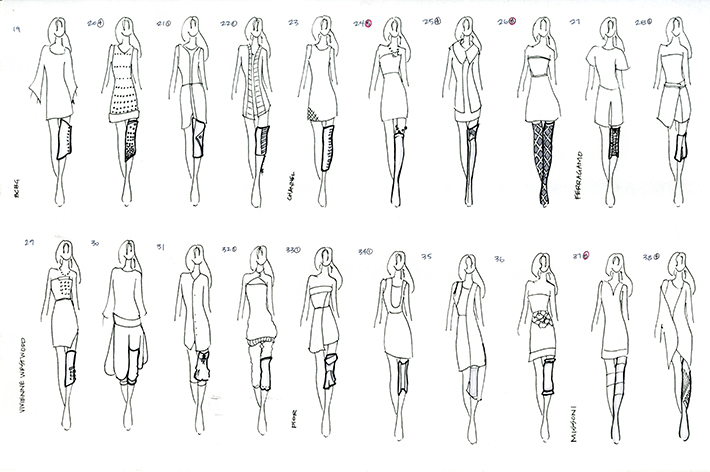 Preliminary sketches were created at the beginning of the project. 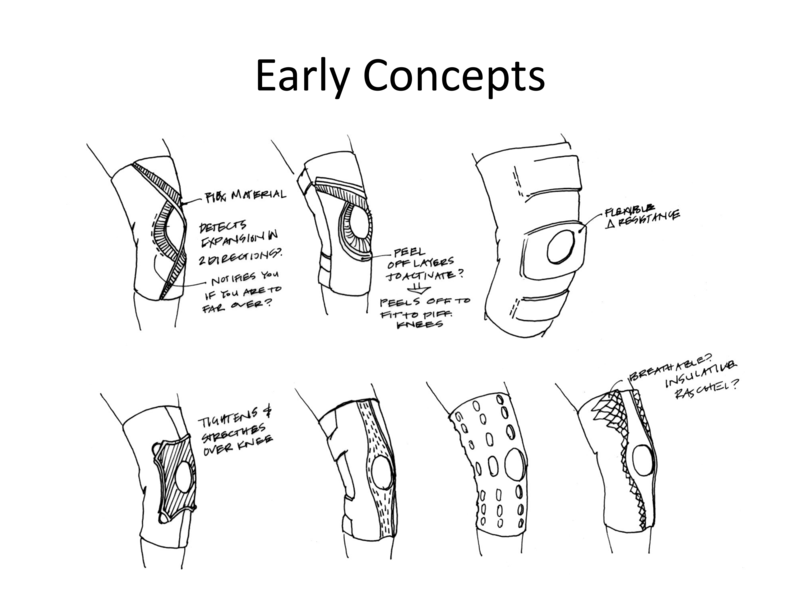 Early sketches explored athletic variations of a knee sleeve using various technologies. 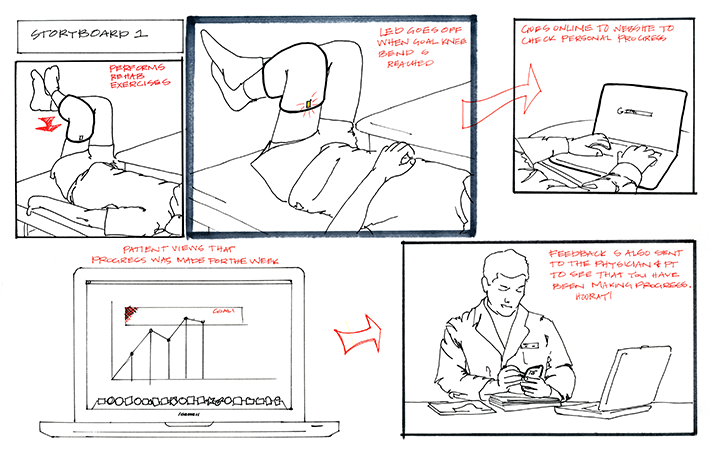 Most sketches exposed the kneecap, using it as a point of reference for user placement. 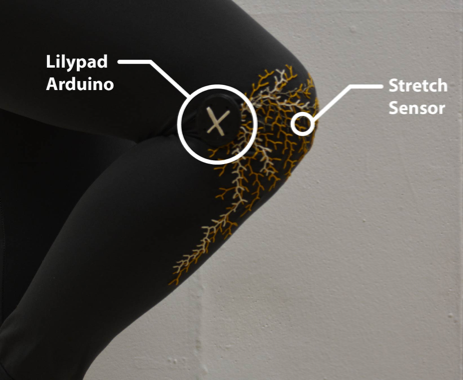 A few other concepts looked into integrating the sensors into common clothing, such as tights, while others looked at simple ways, such as multiple straps, to avoid the scar tissue in the area. Five storyboards were developed. 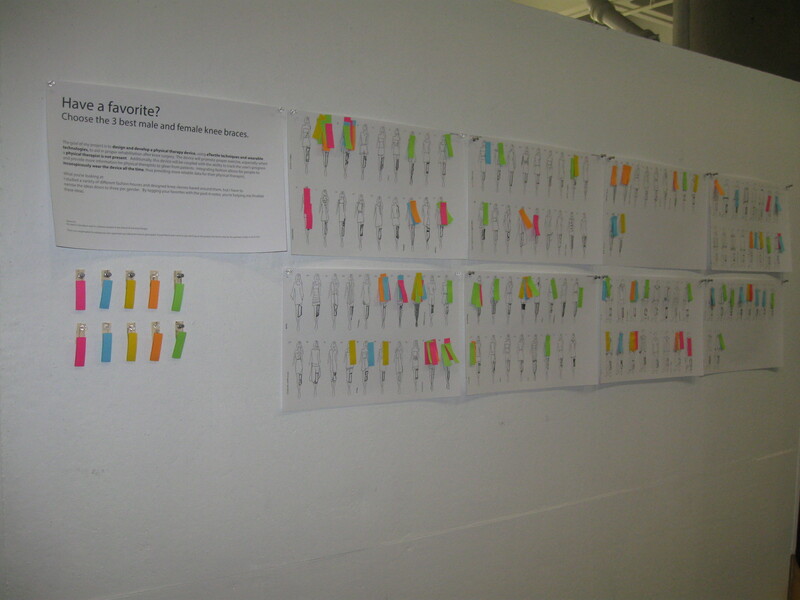 The storyboards introduced different product directions considered for further development. Looking at how users might interact with the system as a whole provided insight into features imperative for prototyping the technology. Physical Therapists will not support a knee brace device because it limits range of motion in the knee. The placement of sensors is incredibly important and changes the level of accuracy. These two points influenced the design in several ways. 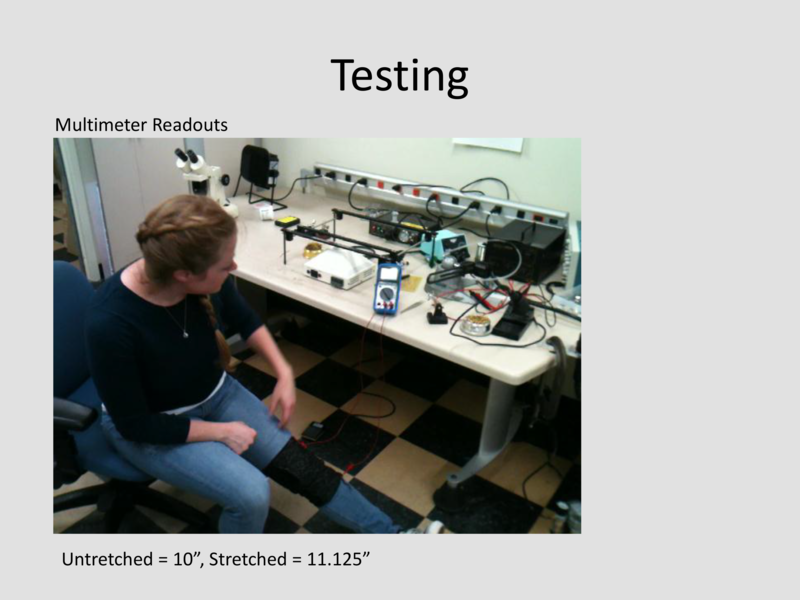 First, the project looked at alternative ways to integrate the sensors since the physical therapists were opposed to a knee brace. Secondly, the project looked at how to maintain body / sensor orientation every time a user put the sleeve on. 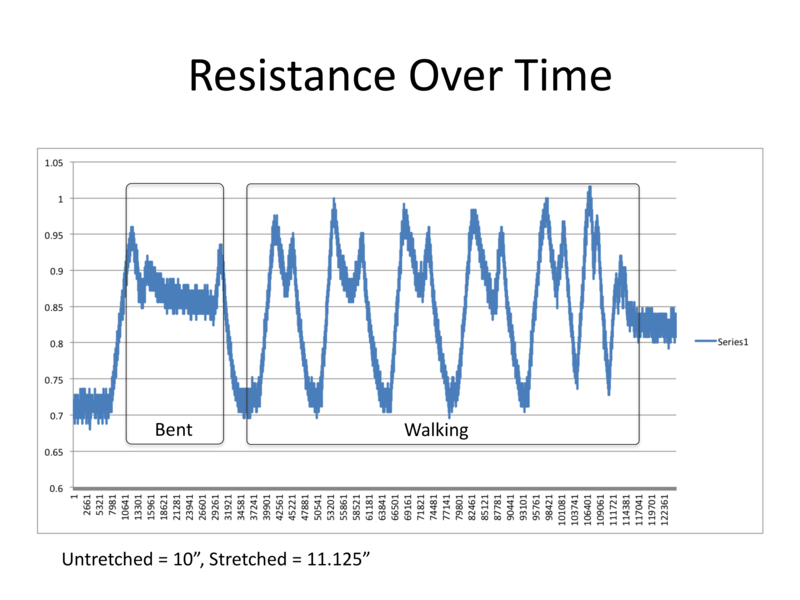 A variety of orientation strategies were considered, tilt sensors, accelerometers, etc., but it seemed easier to put the technology into a wearable device that forced the user to put it on the same way every time. 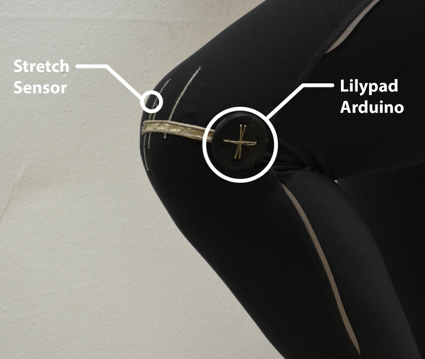 Lastly, compression pants have a variety of benefits for recovery and the integration of the sensors into compression hose could be valuable. 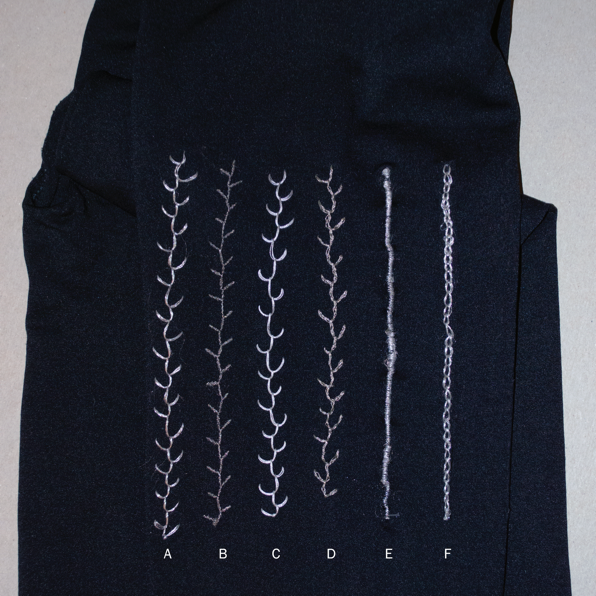 A swatch of different embroidery methods utilizing a variety of conductive threads was created for evaluation. 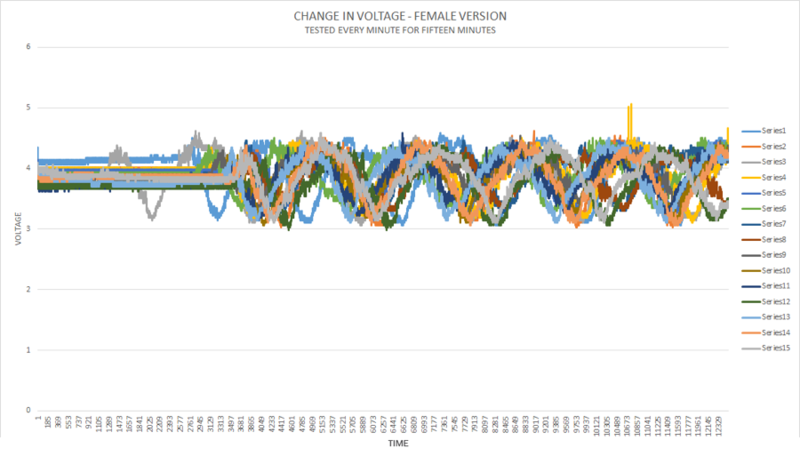 Each pattern measured between 5.5” and 6” long. ‘A’ through ‘D’ utilized the feather stitch used in Figure 52 and used four different conductive threads with different resistances. ‘E’ and ‘F’ used the same conductive thread used in ‘A’, but ‘E’ used a flat embroidery stitch and ‘F’ used an open chain stitch.